The Ingersoll Rand RS250 is one of the new fixed-speed models which are 10% more efficient compared to legacy products. Ingersoll Rand has ntroduced new models to its line of its R-Series oil-flooded rotary screw air compressors, which, the company claims, will provide a more energy-efficient solution for customers with high capacity air requirements. The RS200 to RS250 models are available with the new, state-of-the-art single-stage airend, or the two-stage airend that increases airflow by up to 16%. The new fixed-speed models are 10% more efficient compared to legacy products, claims the company, while the variable speed option is up to 35% more efficient compared to the industry average. Ingersoll Rand has added these models to the Next Generation R-Series portfolio allowing customers who run 24/7 and rely on large amounts of compressed air to have equipment that is as reliable as their demand. According to internal testing, efficiency and design improvements on some of the high capacity compressors deliver up to a €40,000 energy cost savings over a two-year period per compressor compared to previous models . The RS200 to RS250kW models are the third introduction to the Next Generation R-Series line of compressors, following the Next Generation R-Series 30 to 37kW fixed-speed and variable speed drive introductions in 2015 and 2016. 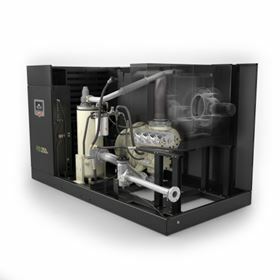 At the core of every Ingersoll Rand Next Generation R-Series compressor is an airend that is specifically designed to improve overall system efficiency. In addition to the enhanced single-stage airend, the RS200 to RS250 models are also available with the new two-stage airend. This two-stage airend is the most efficient airend available today. Each compressor comes standard with Progressive Adaptive Control (PAC) Protection, V-ShieldTM technology, floating coolers and Ultra EL Lubricant. These features help keep equipment running efficiently and maximize uptime for facilities that are manufacturing around the clock. PAC Protection is a unique algorithm developed by Ingersoll Rand and is integrated in the controls system within each compressor. The system monitors key performance parameters for when consumable parts are nearing the end of their life, or if operating temperatures are reaching design limits. In these situations, the controls adjust the parameters to keep the machine running without overloading the motor, preventing unnecessary shutdown. V-Shield technology safeguards all critical fittings by securing them with o-ring face seals in a method that is largely free from distortion. Leaks are virtually eliminated, meaning performance isn’t sacrificed, regardless of how many reconnections are made. HVAC solution for an Ingersoll Rand.